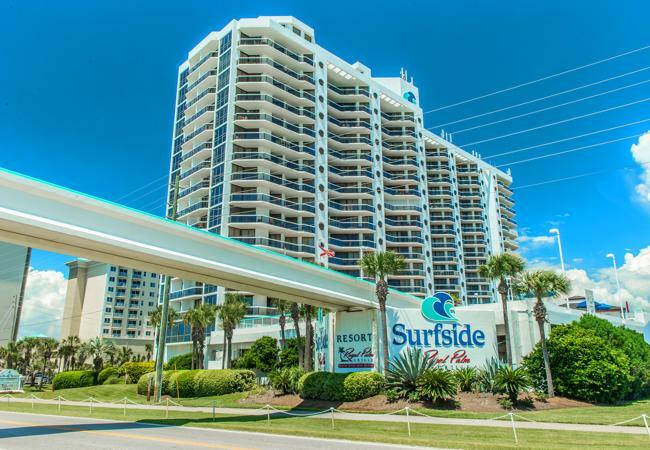 Surfside Resort located in Miramar Beach in Destin Florida, is situated right across the street from the beach, and offers amazing full and partial gulf views from our Studio, 1, 2 and 3 Bedroom Condominiums. Adjacent to the Seascape golf course and located directly across the street from the Gulf of Mexico is an exciting high-rise resort, Surfside Resort. This unique property has an attractive sky bridge that conveniently connects the pool deck to the sugar-soft, snow-white beaches. All units have balcony/patio access from every bedroom and living room. Most units have washer/dryer and a spectacular array of amenities including volleyball and basketball courts, picnic area, meeting room, onsite laundry facilities, high-speed wireless Internet, covered parking and courtesy patrol. Only 3 minutes from one of the largest designer outlet malls in the southeastern United States, Surfside Resort is your dream vacation destination. There is an incredible pool deck featuring heated swimming pool, 2 Jacuzzi spas, kiddie pool, expansive pool deck, saunas and bath house. There is a pool side tiki-bar and beachside food service which is available to all guests. A guest parking garage is available at Surfside Resort, 24 hour security and indoor hallways keep the family secure and out of the weather. In addition, Surfside Resort offers its own on-site dining at the NEW Royal Palm Grille Restaurant featuring a great selection of meat and seafood entrees, pizza, sandwiches, salads, sushi bar, and a children’s menu. All meal selections can be eaten in the dining room overlooking the beach, the sports bar, or even delivered to your room. The meals are wonderful and generous in size so bring your appetite! Surfside Resort is proud of the outdoor sports deck which includes 2 tennis courts, basketball court, volleyball and shuffleboard. The fitness center is recently renovated and is available at no charge. Complimentary unlimited wireless internet is also available. There is a full service spa and salon onsite. Services available include facials, massages and multiple allied modalities, including Jin Shin Jyutsu, Reiki, Reflexology, Thai Yoga Massage, Posture & Pain Functional Movement Assessments. Surfside Beauty Stuio by Slava is a full service European beauty salon and offers a variety of services including hair styling, manicures, pedicures, waxing and makeup.